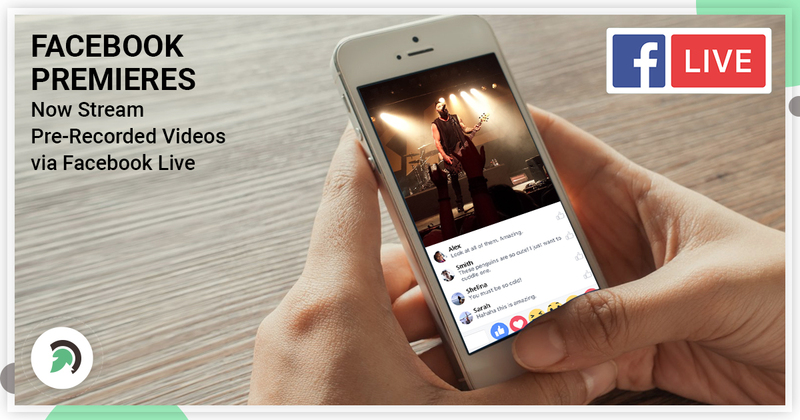 Facebook has launched a new exhilarating video format called Premieres, which allows users to share pre-recorded videos as live stream. The feature lets you post pre-recorded video clips such as movie trailers or some show episodes as though they’re live. Premieres lets you schedule and share videos as live moments. After the broadcast, the video will be saved to your page. Friends and other onlookers can interact with the videos using emoji and comments like they do with Facebook Live. Facebook live videos are watched 3 times longer than common videos. Once you start a live video Facebook sends notifications to all your followers and not only the notifications, but also the live videos are ranked higher than any other type of content in the News Feed. Besides that, when a user leaves a comment on the video, his/her friends can see it on their News Feed and most likely join it. It produces a viral effect on your live video and you can get way more views than followers on your page. This concept was first announced back in April, but it was limited to some extent. Now it’s available to all global Pages. Premieres on Facebook can be of huge importance for the Facebook content creators and the Advertisers. Creators can set a schedule for when their videos will be streamed, making it easier to promote the videos in prior, thus expanding viewership. It will give Facebook content creators more posting flexibility. Advertisers will also be delighted since Premieres arrives with ad breaks. As the format is now opened to global Pages, the ad opportunities will be expected to increase tremendously. The Creators will be able to schedule when their Premieres video will post up to a week in advance. Facebook then will post a placeholder for the video, acting as a reminder for viewers. The Followers of the Page can choose to show they’re interested in the video and sign up for an extra reminder to get notified when the video goes live. They can also share the placeholder before the genuine video posts. 1.Click Share photo or video on the show Page that you want your premiere to broadcast from. 3.Select the video that you want to premiere. 6.Fill in the fields for Premiere start time. Premieres is meant to enhance the user experience and build hype by giving viewers a specific time to visit their pages, complete with the pop-up notifications you don’t get with regular video posts. After the broadcast ends, your video performs in the same way as any other video post on your Page. Benefitting most of the professionals, it might also spur the growth of Facebook Live.